The lead edge of the shaft and lead corner of the seal bore should have a chamfer or radius to prevent damage to the sealing element and for ease of installation. *Sealing lips must always face the medium to be sealed. The lips should be absolutely free and never tilted or pinched. *Seal lip contact area on the shaft should be smooth and must be defect free. *Seals must be installed concentrically and perpendicularly to the shaft, the use of suitable installation tools is recommended. *Seals must not be axially deformed and must never be used to transmit forces. *Silicone rubber seals need special attention because of their poor impact strength. 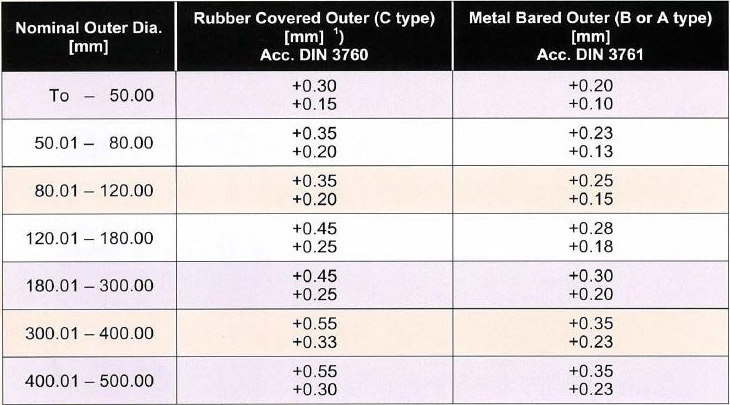 *To obtain a solid installation, Seal's outer diameter must larger than bore diameter, suggested as the following table. 1. Check the bore. Remove any burrs from the leading edge. The inside corner of the bore should have a maximum radius of .031" (0.78mm). 2. Check the shaft. Remove burrs, nicks, grooves and spiral machine marks (machine lead). 3. Check the shaft end. Remove burrs or sharp edges. If the shaft enters the seal against the sealing lip, the end must have a radius or chamfer or a special installation tool can be used. 4. Check splines and keyways. Sharp edges should be covered with a lubricated assembly sleeve, shim stock or tape to protect the seal lip. 5. Check the dimensions. Make sure that shaft and bore diameters match those specified for the seal being used. 6. Check for part interference. Watch out for other machine parts that might rub against the seal and cause friction and damaging heat. 7. Check the seal. Damage may have occurred before installation. A sealing lip that is turned back, cut or otherwise damaged should be replaced. 8. Check seal direction. Make sure the new seal faces in the same direction as the original one. Generally, the lip faces the lubricant or fluid being retained. 9. Pre-lubricate the sealing element. Before installation, wipe the sealing element and shaft with the lubricant being retained. While the O.D. of a metal clad seal can be lightly lubricated to ease installation, the O.D. of a rubber covered seal should always be lubricated. 10. Select the correct installation tool. Press-fitting tools should have an outside diameter approximately.01 0" (.25mm) smaller than the bore size. For best results, the center of the tool should be open so pressure is applied only at the seal outer edge. 11 . Never hammer directly on the surface of the seal. 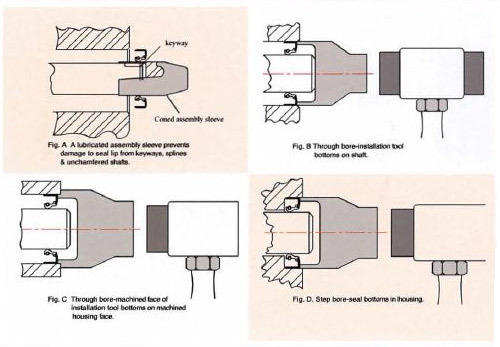 Use proper driving force such as a soft-face tool arbor press or soft workpiece (wood). To avoid cocking the seal, apply force evenly around the outer edge. 12. To avoid cocking the seal, bottom out the tool on the shaft (Fig.B), the housing (Fig.C) or bottom out the seal in the housing cavity (Fig .D).